To the contention that the advent of electronic commerce demands a near-complete jettisoning of existing laws affecting business transactions, the authors of the penetrating essays in this book answer: not so. Rather, the resolution to the challenge lies in the combination of existing legal elements from heretofore disparate disciplines, and the creation from these elements of a new field of legal principle and practice, a field that will nonetheless overlap with classical commercial law. Perhaps the most significant feature of this emerging body of law is that it is necessarily transnational, as e-commerce cannot be contained within national borders. protection of databases: how much is too much? redefining the separate realms of litigation, legal advice, and rule-making as e-commerce grows in the years to come. This book elaborates and updates a staff exchange that took place in 2001 among legal scholars from the Universities of Oxford and Leiden. Its sometimes astonishing, sometimes unsettling insights represent today's clearest, best-informed thinking on the legal aspects of this all-pervasive feature of contemporary society. 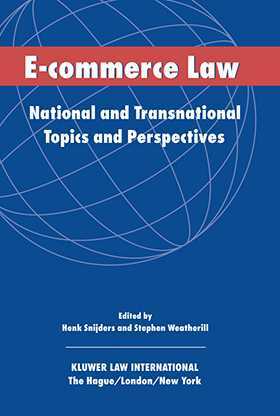 E-commerce is published in cooperation with the E.M. Meijers Institute of Legal Studies of Leiden University Faculty of Law.